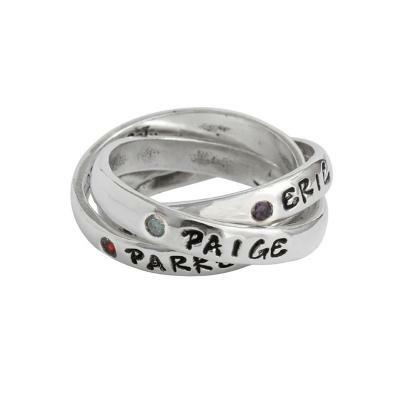 A mother of three will love this triple ring with her kid's names and birthstones. It is a beautiful reminder of what is important in life. Everytime you look at this personalized birthstone name ring on your finger you will think of the joy in your life. The three interconnecting bands will be stamped with names and have a flush set birthstone for that child. What a special gift for the mother of three. Or you can put nicknames, dates, words or phrases. The bands move around on your finger when worn, so the customization on each band will show at different times. This ring is a continually changing work of art. There is a maximum of 12 characters per band. Personalize with the names of three kids for the mother or grandmother of three, put the names and birthstones of Mom, Dad and Baby for the mother of one. Personalize with the word LOVE with the anniversary date and couples names and birthstones for a wonderful anniversary or wedding gift. Very well crafted jewelry and good quality workmanship. Thank you for checking the spelling of the names on rings. Business is kind and professional.